Have you ever wondered what it would be like to actually own a stately home in England? 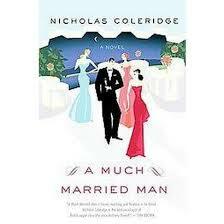 Recently I picked up a perfect bonbon of a novel: A Much Married Man, by Nicholas Coleridge. The protagonist inherits not just the stately home, but the entire village that goes with it. Barely out of what we would call high school, he falls madly in love with a beautiful but totally unreliable girl, whom he manages to marry. He can hardly believe his good luck. He happily moves with her into a tiny cottage in the village. (His decrepit and confused mother occupies the stately home itself, and pretty much monopolizes the grand old rooms.). But his luck doesn’t last long; off goes his true love, leaving him with a much-cherished baby daughter and greatly reduced prospects. Instead of going to Oxford or Cambridge, he works on the farm of the estate so that he can take care of the little girl. The family money comes from a venerable London banking firm that can get along very nicely without this gullible young man. Soon enough, there are more assorted wives and mistresses, and more children. The honorable and kind-hearted hero is generous to a fault with all of them, and all of the romances end in disaster of one kind or another. Without fail, though, he loves and cares for all the children. The third wife is the worst nightmare. She moves everyone out of the stately home and undertakes a year-long modernization which makes hash of the history of the place. Worse yet, she brings with her a psychopathic and violent son. In her eyes, the son can do no wrong. So the hero has to bail him out of outrageous scrapes, and worse. Eventually, the hero finds himself toiling in London in the family’s bank. Much to his and everyone else’s surprise, he is good at it. But times being what they are, the bank is ripe for collapse. The hero nearly loses his home and his village. At least partial salvation comes when some of the hangers-on he has put up with persuade him to make the estate a venue for rock concerts and such. The fun of the book is the intimate look at life in the upper crust. Things look glamorous from the outside, but there is never quite enough money. Heating a huge old uninsulated pile is so costly that family members routinely wear overcoats and mittens around the house. The quaint cottages and rectories on the estate are chilly and damp, with hopeless or nonexistent plumbing. All manner of disasters begin and are exposed at impossibly fancy parties and clubs like Annabel’s. Mr. Coleridge makes fun of his own very posh social set. I’m sure I don’t get half the references to people and the brand names of their material possessions. But I get the idea. Against all odds, there is a happy and unexpected ending–one the hero deserves just because he is such a good-hearted fellow. Only after I finished the book did I realize that Mr. Coleridge is the head honcho of Conde Nast Publications. He owns an actual stately home in Worcestershire, the 1709 Wolverton Hall. It was featured in the December 2007 issue of Conde Nast’s World of Interiors magazine. (I don’t think the house is open for tours). A review of the book, from The Guardian, is at http://www.guardian.co.uk/books/2006/apr/30/fiction.features3. Did I call this a beach read? Better yet, read it on a plane on the way to England! Join me next time for more explorations into the art and history of Europe and the British Isles. This entry was posted in British Isles, England and tagged " Nicholas Coleridge, "A Much Married Man, Conde Nast Publications, owning an English stately home, owning an English village, Wolverton Hall, Worcestershire on July 12, 2013 by Claudia Suzan Carley. Done! I just put it on my list of “To Read Books.” You have offered many good suggestions for books and movies on this blog, I shall continue to follow it. I hope I can someday find the time to read or view each one of them. Thanks for your comment. So many books and movies, so little time! How very kind of you. I am so flattered that you enjoyed my book. Thank you. Lovely of you to comment! I hope my summary was accurate, since I was writing from memory. I’ve loaned my copy to a friend who is enjoying it very much.